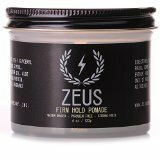 The ZEUS pomade is one of my favorites. It comes in a decent looking plastic jar with a metal lid. It is clear. Has a firm texture but is very easy to loosen. Its citrusy scent is smooth and un-dominating. The application goes nicely and it takes very little product. The hold is fabulous throughout the whole day. The pomade mostly dries, but it is totally re-workable if need be. Washing it out is as simple as rinsing your hair. As far as procuring this pomade, it can be bought on AMAZON.CA for about $20. This is where I got my jar. In fact, the first jar was damaged and the pomade had suffered in that areas. It was no trouble to get a replacement from AMAZON and I was set within a few days. Here is the rating on a scale of 1 to 5, where 5 is a perfect score and/or the level of shine.